PRINCETON, N.J. -- For the second straight year, more Americans name real estate than stocks, gold, savings accounts/CDs or bonds as the best long-term investment. 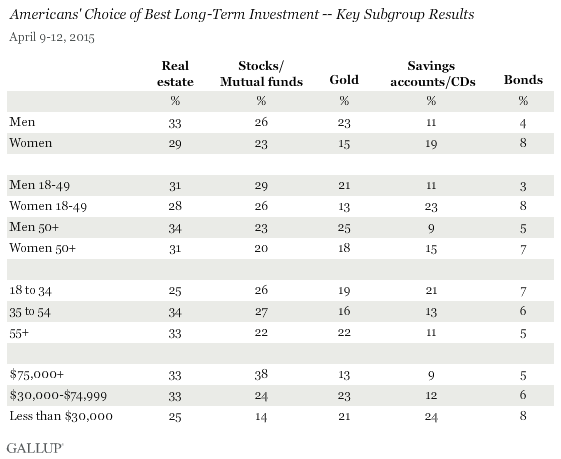 Real estate leads with 31% of Americans choosing it, followed by stocks/mutual funds, at 25%. Meanwhile, gold dropped to third this year, a significant change from 2011 and 2012, when it was the runaway leader. The percentages of Americans choosing real estate and stocks are steady this year compared with 2014. This follows three years, from 2011 to 2014, of increasing partiality toward both investments as the housing and stock markets recovered and gold's appeal waned. The public's preference for gold fell five percentage points in the past year, bringing its overall decline since 2011 to 15 points, the largest shift seen among the five investments tracked. 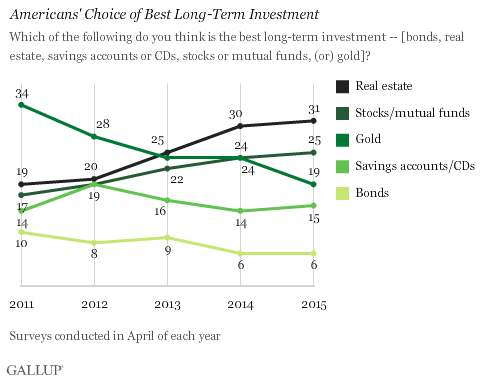 Savings accounts and bonds consistently have been lower on the list, although those identifying savings accounts as the best investment reached 19% in 2012 -- comparable to stocks and real estate at the time -- possibly reflecting Americans' greater desire for stability and security in the first few years after the 2008-2009 financial crisis. This figure has since stabilized near 15%. The percentage choosing bonds has only decreased since Gallup's baseline measure in 2011. 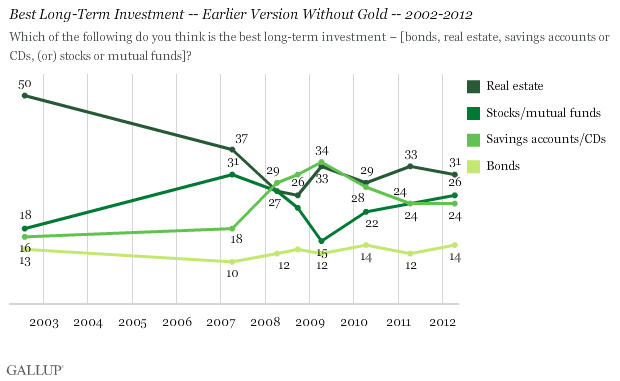 While this trend originates in 2011, an earlier version of the Gallup question that did not include gold shows significant shifts in preference for real estate and stocks between July 2002 and April 2007, with real estate declining from 50% amid the housing boom to 37% when values began to drop, and stocks increasing from 18% to 31% over that same time. Preferences for both then sunk further in 2008 and 2009 as the housing and equity markets suffered severe losses amid a housing mortgage crisis and the resulting global banking crisis and 2007-2009 recession. Today real estate is either the top choice or tied for the top choice as the best investment among all major gender, age and income groups. Stocks, on the other hand, faces more competition for second place from gold and savings accounts among some groups. Real estate took a pounding in home values and consumer confidence after the subprime mortgage crisis that started in 2007 spurred the financial crisis of 2008, deepening the 2007-2009 recession. Gold gained appeal during this time, likely due to its tangible quality, but this has proved to be temporary. A return of Americans' confidence in real estate and stocks as solid long-term investments was first evident a year ago, paralleling real world improvements in these areas. Their continued strength this year indicates that was no fluke. Meanwhile, gold has slipped even further as an attractive way to maintain or grow wealth.